One of my peeves is when Andrew Wommack talks about the Needle's Eye. Yehoshua said that it is easier for a camel to go through a needle's eye than for a rich man to enter into the Kingdom of Heaven. I heard many years ago that The Needle's Eye is a little gate within a large gate to a city, wherein people can enter the city after the large gates have been closed. If a man with a camel wished to enter, he had to unload his camel first and then compel the camel to crawl through the gate on its knees. 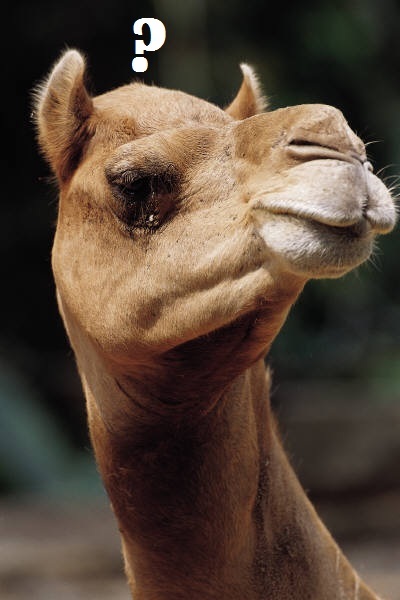 It was extremely difficult for the camel to do, and extremely difficult to get the camel to do it, but it could be done. Once the camel was through the little gate, the owner strapped his baggage back onto it. Andrew said that when he was in Jerusalem on a tour, he told the tour guide that he wanted to see this little gate that is called The Needle's Eye. The tour guide said that they would not have time to see it. Andrew kept insisting until finally the tour guide told him that there is no such gate. He said that when the government trains tour guides, they tell them to agree to whatever the tourists say and help them to have the epiphany they are looking for, as tourism is so vital to their economy. This man went on to say that people have made ridiculous requests. Tourists have asked him to show them the burning bush, as if it is in Israel, and still burning since the time of Moses. He took them to a field behind a gas station that had been burned. There were enough burnt shrubs to satisfy them and they even took pictures! Okay, so some people are REALLY dumb, but that doesn't mean that the tour guide was correct about there not being a little gate called The Needle's Eye. There used to be a little gate like that in the Jaffa Gate. Maybe it's still there and the guide just didn't know about it. I learned this from Barbara Bowen's book Strange Scriptures. Barbara Bowen used to be a missionary who lived in Israel in the 1940's, and possibly earlier. Her book is one of my treasures because it explains a lot of things in the Bible that were still cultural practices when she lived in Israel. Andrew used the tour guide's misinformation to make his point that Yehoshua was saying that it is impossible for a rich man to enter into the Kingdom of Heaven without His help, that He was talking about a literal needle. No, the old illustration is true, wherein the point has been often made that, to enter the Kingdom of Heaven, we have to strip away our fleshly desires and humble ourselves, like camels that have to go on their knees through the little door in the gate. I think that Yehoshua was making the point that, even with His help, it is very difficult for someone who is rich to enter into His Kingdom because when one has the means to indulge their selfish lusts, there is a huge temptation to do so. It kind of makes me wonder that Andrew so readily believed the tour guide that there are no little doors in the large gates of the city, or consider that there possibly used to be. In Bible days, people did not have the technology that we have nowadays, but that doesn't mean that they were dumb. It seems logical to me that it would occur to city builders to put little doors in the gates, so that travellers who arrived late at night could get in, such as a scout or courier who had an important message for the governor of the city.